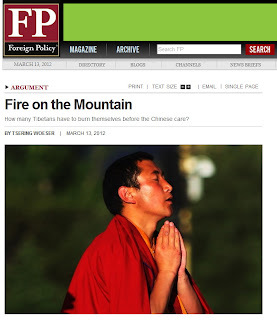 How many Tibetans have to burn themselves before the Chinese care? 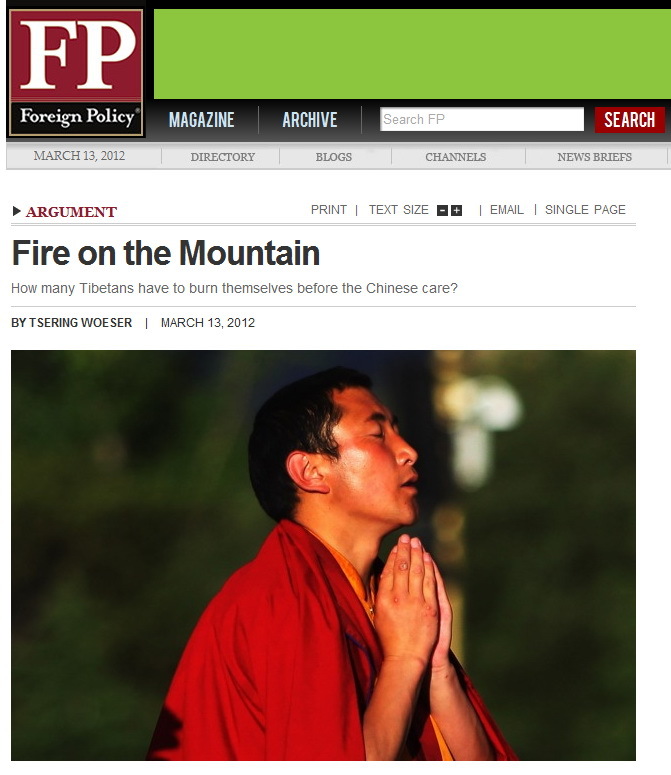 Twenty-seven Tibetans have set fire to themselves since 2009 in protest against Chinese rule. Since this January alone, 14 people have done so. A total of 20 have died in the past few years from self-immolation; an unknown number of Tibetans have been tortured or detained since protests broke out in 2008. What has been the reaction within China to this huge human disaster? Silence, mostly. Why? There's a Tibetan saying: "Hope ruins Tibetans; suspicion ruins Han Chinese." I'm not sure when this saying came into being or what its background is. I only know that this expression falls off the lips of many Tibetans, who use it meaningfully, mockingly, or helplessly. For the Han Chinese, who make up more than 90 percent of China's population, there is a similar expression engraved in their history books: "Whoever is not among us must be of a different heart." Originally, these words were not frightening. Over the years, though, the sentiments they express have created an atmosphere of raw violence. Minorities stand in the way of the grand unity of China's different peoples; they must be Sinicized or extinguished. The ethnic minorities who live in China, the Tibetans, Uighurs, Mongolians, and others, understand that this view of ethnic minorities is actually quite widespread, that it is the mainstream, that they receive little empathy from the majority. A few Han Chinese have spoken out. Human rights lawyer Teng Biao said this year that "Chinese public intellectuals have kept mum [about the immolations], pretending to be ignorant of what's happening, silently cooperating. They are as shameless as the murderers themselves." In 2008 after the authorities suppressed the Tibetan protests, Teng and more than 20 Chinese rights lawyers issued a public statement saying they were willing to provide legal assistance to those Tibetans who had been arrested. As a result, Teng lost his lawyer's license; the other lawyers involved also met with difficulties. Over the last year, China's leading human rights lawyers have come under harsh attack, and now few would dare take on sensitive cases involving Tibetans. But even some Chinese dissidents and human rights defenders have double standards when dealing with ethnic minorities. In their view, democracy, human rights, freedom, and other values in China apply only to Han Chinese. When it comes to ethnic minorities, they say, "So sorry, you cannot bask in these rays." Although they consider themselves the victims of autocratic rule, they are still not aware that to ethnic minorities they themselves are the embodiment of autocracy, that they themselves are doing harm. The authorities always say that they "liberated" Tibet, bringing "happiness" to 6 million Tibetans. But why, so many years after the 1959 liberation, are the serfs revolting against their liberators? The authorities have an explanation: The "Dalai clique" is to blame for all this -- the protests, the young Tibetans taking to the streets, the violence. Chinese media have turned this lie into public opinion. And the Chinese people, indoctrinated by the one voice with which the Chinese media speaks, don't understand why Tibetans protest and don't care to learn. Tibetans have no voice in China. The Dalai Lama, who has been in exile for 53 years; the Panchen Lama, who has been missing for 17 years; the 27 people who have set fire to themselves over the past three years, a group of people between the ages of 17 to 41, monks and nuns, farmers, herders, students, and the parents of children -- the only existence they have in Chinese society is one in which their reputations have been sullied and the truth has been distorted. How many members of Tibet's elite have been disappeared by the party apparatus and now sit in some black jail somewhere? And still the Han Chinese say nothing. Many keep silent because they accept the concept of grand unity, where all minorities need to be shoehorned into fitting under Chinese rule. Some keep silent because they mind their own business, a traditional principle of Confucianism that has devolved into selfishness. And some are silent because they are afraid. In Beijing recently, someone transmitted news of a Tibetan committing self-immolation on Sina's microblog (China's Twitter). 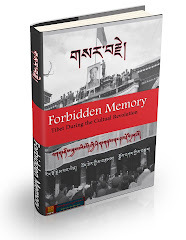 The police took him to a police station in the middle of the night and warned him not to mention Tibet again. This silence can be broken. If Han Chinese and Tibetans speak out about what they have seen and what they have heard, the unbridled repression will be restrained, or at the very least, when the gun is being fired, maybe it will miss its target. Silence, not hope, ruins Tibetans. To avoid being destroyed, our only choice is to destroy this silence. Tsering Woeser is a Tibetan poet, writer, and blogger living in Beijing. 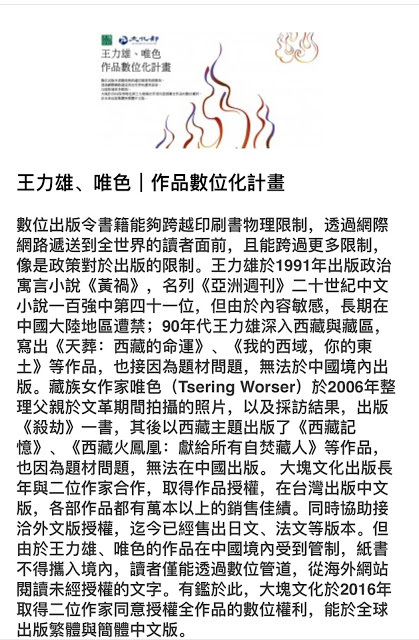 Paul Mooney, a Beijing-based journalist, translated this essay from Chinese.